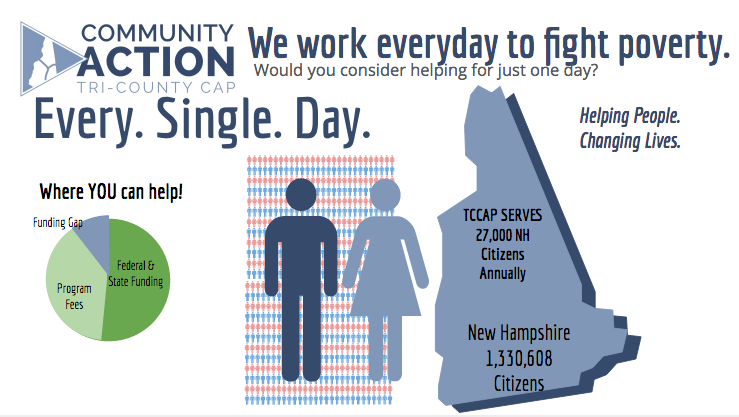 Since 1964, Tri-County Community Action Program, Inc has made a difference in the lives of New Hampshire residents by helping them in their time of need. Thousands of households rely on us every year for assistance in achieving self-sufficiency and maintaining financial stability. Perhaps we have helped you or someone you know. Now we need your help to maintain our own financial stability. Unrestricted means TCCAP can address the most pressing needs whenever and wherever they arise. Tri-County Community Action Program, Inc joins #GivingTuesday. 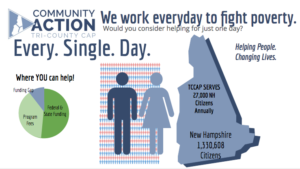 Tri-County Community Action Program, Inc (TCCAP) has joined #GivingTuesday, a global day of giving that harnesses the collective power of individuals, communities, and volunteers to encourage philanthropy and to celebrate generosity worldwide. Senior Meals of Coös County is asking for help to purchase paint for the Senior Meals dining room. Donors may walk into Aubuchon Hardware, in Berlin and purchase a gallon of paint, a brush, roller or tape to donate to the cause. Call Aubuchon Hardware (603) 752-4103 or visit the store or Senior Meals for more information. Or donate at tccap.org/donate or Senior Meals at 610 Sullivan St, Berlin. Sign up to volunteer from home as a Support Center Advocate for our 24 Hour Domestic Violence & Sexual Abuse Hotline in Grafton County. Receive free training & staff support. Call (603)44-0624 or go here to fill out an application. Tri-County Transit is looking for people to sign up to become volunteer drivers for the Long Distance Non-Emergency Medical Program. Tri-County Transit transports elderly and disabled individuals to medical appointments in Coös, Carroll, and Grafton counties. Call Transit (603)-752-1741 or go to www.tricountytransit.org/volunteer. Sign up to volunteer with Coös County Retired Senior Volunteer Program (RSVP). RSVP Volunteers provide friendly visits to homebound seniors, phone calls, handy helpers services, knitting, or serve the community through special RSVP projects. Call (603) 752-4103 or go here. The Tyler Blain House Homeless Shelter Residents are asking for: Dish Soap, Gas Cards, Laundry Soap, Men’s Socks, & a wifi enabled tablet for shelter guest use. Call (603) 788-2344 or drop off donations at 30 Exchange St. Berlin, 56 Prospect St, Lancaster Or 448 White Mtn Hwy, Tamworth. #GivingTuesday is held annually on the Tuesday after Thanksgiving, November 28th this year to kick off the holiday giving season and inspire people to collaborate in improving their local communities through local giving.